Thanks to Grandma's English dessert recipes, you can make old fashioned English toffee, pancakes, fruitcakes, fruit pies, pound cakes, coffee cakes, and more. You'll enjoy the Old Country taste of these traditional British desserts. 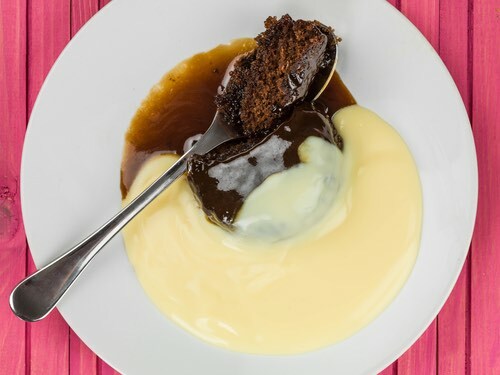 The now traditional English dessert recipe for sticky toffee pudding is thought by many to have originated with a Mrs. Martin, chef of The Old Rectory Hotel in Claughton, Lancashire. However, the yummy dessert does have a Canadian connection, since it's rumored that she had obtained the recipe from a Royal Canadian Air Force officer who stayed at her hotel during World War II. Sticky toffee pudding consists of a moist sponge cake with chopped dates, and a toffee topping. It's often served with custard sauce or vanilla ice cream. Sift flour and baking powder into a bowl. In a large bowl, beat together the butter, sugar, beaten egg, and about half of flour mixture. Gradually mix in remainder of flour mixture and beat batter for about one minute. Pour boiling water over the chopped dates, stir in baking soda and vanilla, then add to batter and mix in well. Pour batter into buttered 11x7x2-inch cake pan, bake for about 35 to 40 minutes in 350°F oven, or until surface is firm to the touch. This tasty English dessert recipe makes about 6 servings. Add brown sugar, butter, and cream to saucepan, and bring to boil while stirring constantly, continue to stir and simmer for about 3 minutes. Remove from heat and pour over hot pudding to serve. If you love the sticky toffee topping, you might want to double the ingredients to ensure you have lots to pour over the pudding and run down its sides. 1-1/4 cups white sugar, 1 cup corn syrup, 3 oz butter. Boil to hard ball stage. Don't stir too much. Add vanilla to taste and put in buttered dish. 1 pint milk, 1 tablespoon sugar, 2 eggs, 1 cup flour, 1 teaspoon baking powder, pinch of salt. Sift the flour, salt, and baking powder together. Add to this the well-beaten eggs and sugar, and mix all with the pint of milk. Mix all ingredients thoroughly. If too thick, add more milk. Put a small piece of butter in a hot frying pan, then spoonfuls of the batter. When lightly browned, turn over, then fold on hot dish. Serve with powdered sugar and a squeeze of lemon. 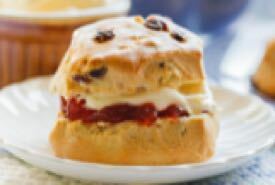 Cream one and a half cupfuls of butter and the same of sugar with three eggs; add one and a half cupfuls of milk, four cupfuls of flour, two cupfuls of currants, citron if liked, half a teaspoonful of mixed spices and a teaspoonful of soda. 1 cup beef suet (finely chopped), 3 cups flour, 1 tablespoon sugar, pinch of salt. Mix salt into the dough, and roll out 1/2 inch thick. 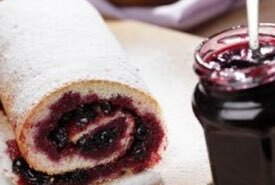 Spread black current preserves on the dough, roll up, tie in a cloth and boil 1-1/2 hours. Be sure to have the water boiling before putting the pudding in. Serve with a sweet pudding sauce. 1 lb butter, 1 lb light brown sugar, 9 eggs, 1 lb flour, 2 teaspoons mace, 2 teaspoons cinnamon, 1 teaspoon soda, 2 tablespoons milk, 3 lb currants, 2 lb raisins, seeded and finely chopped, 1/2 lb almonds, blanched and shredded, 1 lb citron, thinly sliced and cut in strips. Cream the butter, add sugar gradually, and beat thoroughly. Separate yolks from whites of eggs; beat yolks until thick and lemon colored, whites until stiff and dry, and add to first mixture. Then add milk, fruit, nuts, and flour mixed and sifted with mace, cinnamon, and soda. Put in buttered deep pans, cover with buttered paper, steam three hours, and bake one and one half hours in a slow oven, or bake four hours in a very slow oven. 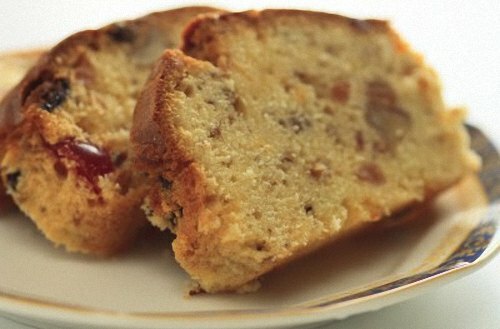 Rich fruit cake is always more satisfactory when done if the cooking is accomplished by steaming. 5 lb suet, 5 lb apples, 4 lb citron, 1-1/2 lb blanched almonds, all finely chopped; 5 lb raisins seeded, 5 lb currants, 5 lb light brown sugar, 1/2 teaspoon mace, 1/2 teaspoon cinnamon, 2-1/2 cups brandy. Cook raisins, suet, apples, citron, currants, and sugar slowly for one and one-half hours; then add almonds, spices, and brandy. Fill a pudding dish with fresh fruit, and enough sugar to sweeten, but do not put sugar on the top as it tends to make the pastry heavy. 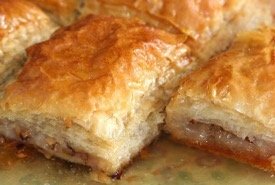 Add a little water, brush around the edges of the dish with water, then take a narrow strip of pastry and put round, brush this lightly with water, then cover the whole top with pastry, mark round the edge, and bake in oven suitable to the pastry used. If the pastry is cooked before the fruit, place the pie in a cooler part of the oven to finish, with buttered paper over the top. 1 pound butter, 1 pound sugar, 1 pound flour, 8 eggs, 1 wineglass brandy, 1 pound raisins, 1 pound sultanas, 1 pound currants, 1/2 pound prunes, 1/4 pound dried cherries, 1/2 pound candied peel, 1/4 pound almonds, 1 teaspoon mixed pudding spice, 1 teaspoon baking soda, 1 teaspoon browning. Beat butter and sugar to a cream, mix all the prepared fruit together — the almonds shredded, the cherries cut in half, and the prunes into small pieces — and beat the eggs until light. Now mix alternately into the butter and sugar, the flour, eggs and fruit, when this is thoroughly well mixed, add the spice, brandy, browning, and soda. Mix well again, then put the mixture into prepared tin, and bake in moderate oven from four to five hours. One cup of butter rubbed to a cream, with two cups of the very darkest brown sugar; add four eggs, one at a time, stirring each one well; then add a cupful of black molasses and one cup of hot, strong coffee in which you have previously dissolved one even-teaspoonful of soda. (Strain before adding to the batter.) Sift four and one-half cups of flour, twice, adding two teaspoonfuls of cream of tartar in last, half a cupful of flour, sifting again before adding. Add the following spices: nutmeg, mace, allspice and cloves, half a teaspoonful of each, one large cupful of raisins, seeded, and half a cupful of finely cut or chopped citron, dredge the raisins with flour, using some of which you have already sifted, not using more than four and a half cups in all. Butter your cake tins and seed your fruit before beginning to make the cake; whole spices freshly pounded in a mortar are preferable to ground spices. This quantity makes one good-sized cake and twelve gems, which if iced prettily makes quite a display. As a young girl, my Grandma McIlmoyle immigrated with her family from England to Canada in 1887. They built their homestead on the bleak Alberta prairie, and Old Country desserts such as the ones featured on this page served to brighten their solitude and remind them of their former home. Now, thanks to these English dessert recipes, you can taste the delicious Victorian Era desserts that Grandma once enjoyed. Get ready to enjoy a real treat. You'll appreciate the delicious, old fashioned taste of these classic dishes. 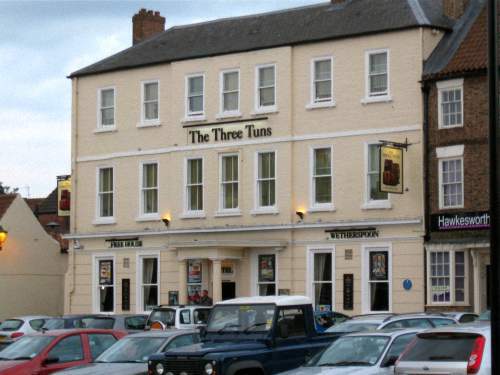 My wife Vicki and me once vacationed in Thirsk, North Yorkshire, where we stayed at The Three Tuns Hotel, and mostly ate in its Wetherspoon pub. We enjoyed delicious English meals of steak and kidney pie, fish and chips, and for dessert, the traditional sticky toffee pudding for which an English dessert recipe can be found above. The Three Tuns was originally built in 1698 as a Dower House for the Bell family, Lords of the Manor of Thirsk, and it was sold and converted to a coaching inn around 1740. Now a Wetherspoon Hotel, lodging at the quaint old inn with its paneled dining room and beautiful Queen Anne staircase was a treat for us, because of its earlier connection to my Bell ancestors.